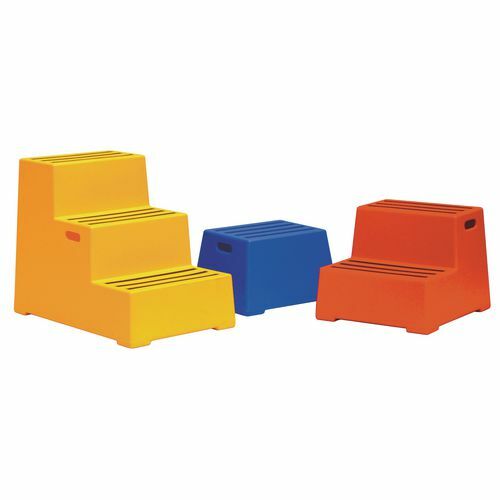 Lightweight, medium density polyethylene moulded steps. Fitted with slip resistant abrasive strips to aid safety. Choice of three colours, other colours to special order. W x D x H: 485 x 310 x 300mm. Steps are useful to help the user reach high up areas that they may not be able to get to otherwise. Our plastic safety step with one step offers an easy and safe way to access hard to reach areas. 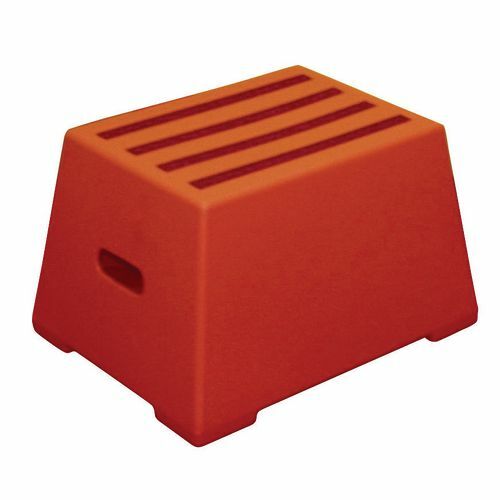 They are lightweight, medium density polyethylene moulded steps, meaning they are durable and simple to move. Fitted with slip resistant abrasive strips to aid safety and with a heavy duty 260kg capacity these steps are a great addition to the workplace, aiding to move heavy items. They are also waterproof and chemical resistant making them suitable for most workplaces. There is a choice of three colours; blue, red or yellow and they comply with EN14183 2003E, so you know they are quality products. Our plastic safety steps with one step are safe and durable, providing great assistance to access hard to reach areas. They come with a 12 month guarantee and FREE UK Delivery.